If your doctor has told you that you have leaky gut, you may be wondering exactly what that is, and what it means. The lining of your intestine can develop cracks and holes when it's not healthy. All types of things can then leak out and affect the tissues surrounding the intestine, and this can lead to problems outside as well as inside. That is leaky gut. People develop leaky gut for many different reasons. For some of us, it has to do with our genes. Others are affected by stress or diet. The best way to treat leaky gut is to take away foods that are inflammatory such as alcohol, processed foods, and others to which you are sensitive, and replace them with a healthy diet. Here are the four worst foods for people with leaky gut to eat, as well as the four best. 1. 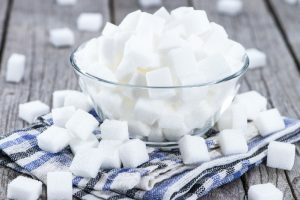 Sugar – Sugar feeds the yeast and bacteria that lurk in your gut. This can start irritation or cause further irritation if it already exists. 2. Dairy – You love cheese, milk, and yogurt, but it may not love you. Cow’s milk has proteins that are hard for people with leaky gut to digest. Switch to plant-based milks or goat milk. 3. Alcohol – Your glass of wine or beer or your nightly cocktail stops your body from making prostaglandins. When you don’t have enough prostaglandins, you have a higher chance of gut irritation. You also stop nutrients from getting into your system. 4. Gluten – You may not have celiac disease, but gluten in foods is likely to make you feel worse if you have a leaky gut. Switching to gluten-free foods may help your intestines to heal. 1. Collagen – By drinking bone broth and other collagen-rich foods, you help build new tissue and heal the lining of the gut. 2. 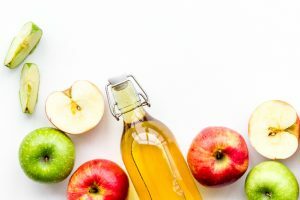 Apple cider vinegar – When you add a tablespoon of apple cider vinegar to your daily diet, you kill yeast and bad bacteria in your gut. Make sure the label on your ACV says “contains the mother.” Getting rid of these harmful elements lets your intestines heal and allows good bacteria to grow. 3. Probiotics – One of the best things you can do to heal a leaky gut is to add plenty of good bacteria to your gut’s environment. Kefir, sauerkraut, kombucha, and kimchi are all great choices. 4. Prebiotics – These are the foods that feed the good bacteria in our guts and help them to multiply. The best foods for healthy bacteria are resistant starches that our guts can’t break down. Leaky Gut Syndrome can cause a host of other health problems if left untreated. But with these tips on which foods to eat and which ones to avoid, you can start healing your gut. P. S. Feel free to share this article with anyone you might know with Leaky Gut! And then comment below — have you given up any foods out of concern for Leaky Gut?